The high-performance computing center planned for downtown Holyoke will apparently become reality in the next 12 to 18 months. While details of that venture  to involve UMass, MIT, and many other institutions  are starting to emerge, speculation has begun in earnest about what kinds of economic-development opportunities will follow such a project. Those involved in a task force to develop something to be called the Innovation District in the heart of the city say much depends on the research agenda that will emerge at the center. But all signs point to an enormous opportunity for this former paper and textiles hub, and the goal moving forward is to fully leverage this asset. Jeff Hayden was recalling some of the Holyoke history hes known since he was a child. He cited the chapter in Holyoke history written between 1850 and 1880 as he discussed the high-performance computing center that will now apparently become reality in the Paper City  and, perhaps more importantly, what could follow that facility in terms of economic-development potential. Hayden is not predicting that history will repeat itself with such profound growth, but then again, hes certainly not ruling it out. Such is the power of imagination, and speculation, when it comes to the computing center, a concept that most people in this region, including many of those most-closely involved with it, are struggling to get both hands around. But optimism abounds, and there is widespread sentiment that the $50 million facility could change the landscape in this city that has been trying to reinvent itself since most of the mills closed decades ago. What is known is that UMass, MIT, Boston University, CISCO, EMC, and several other partners will come together and build a facility somewhere along the canals in downtown Holyoke. This much was announced at a packed press conference in late October that featured Gov. Deval Patrick. What is also known is that the computing center will be a nonprofit venture that will not pay taxes to Holyoke and will create perhaps only a few dozen jobs to start, by most early estimates. What isnt known is what kind of economic development can follow such a facility. There are other so-called super-computing centers around the country, but most have been in existence only a short time, so there is no real body of evidence to show what can happen in Holyoke. But there is widespread speculation that government agencies, private businesses, support services, and perhaps (or probably) all of the above will want to locate around the computing center, said Kathy Anderson, director of the Holyoke Office of Planning and Development. She, like others, said that much will depend on the research agenda that emerges at the center. But there are some common denominators. There is a pattern developing about the kinds of businesses that want to be located near these centers, she said, noting that her office is conducting research on the subject. And there is ample reason to believe that many companies and institutions will want to be around this particular center, she continued, because of its uniqueness with regard to how it will be powered. Indeed, inexpensive hydropower will be the primary source of energy to drive and cool the computers, said Anderson, adding quickly that this is an attractive drawing card at a time when many businesses and institutions want to portray themselves as environmentally conscious. Its clean, its green, and its comparatively cheap, she noted. Anderson will be one of the co-chairs of a task force charged with exploring development opportunities in what will be called the Innovation District in downtown Holyoke, where the center will be built, although the exact location isnt known. She said the group will likely begin meeting next month, and while its specific charge hasnt been put down on paper, it amounts to devising strategies to help enable Holyoke to leverage, and thus take full advantage of, an incredible opportunity. Tim Brennan, director of the Pioneer Valley Planning Commission and the other co-chair of the task force, put things a different way. 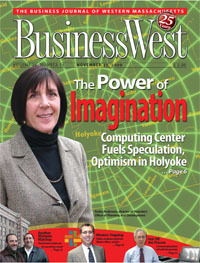 For this issue, BusinessWest talked with many who will be directly involved with this Innovation District about what the computing center could mean for Holyoke, and how the city can capitalize on this enormous asset. Brennan acknowledged that, like many who now have high-performance computing center as part of their vocabulary, hes still trying to grasp the concept. Theres much that he doesnt know about these facilities and the economic development that they could spur. What he does know is that nothing will happen overnight, and also that there is no clear model to follow, or anything approaching same. Therefore, mapping out strategies will be challenging, but also rather exciting, he said, noting that a $50 million facility built by some of the top research institutions in the world is going to be dropped into the middle of an urban center, specifically a low-income community still struggling to gain a new identity after much of its paper and textiles mills closed down or moved south. That makes this still-unnamed facility rather unique and potentially attractive, said Anderson, noting that most of the existing super-computing centers are located on or near college campuses (such as Ohio State University, the University of California at San Diego, and the University of Hawaii), or in rural areas such as Rio Rancho, N.M., Fitchburg, Wis., and Butte, Mont. Research into existing centers reveals that most have affiliations with both universities and federal agencies or departments, she continued. The Advanced Biomedical Computing Center in Frederick, Md., for example, is affiliated with the National Cancer Institute and the National Institute of Health. The Maui High Performance Computing Center, meanwhile, has affiliations with the U.S. Air Force and the Department of Defense, and Research Triangle Park in Raleigh-Durham, N.C., has one with the Environmental Protection Agency. But the likely scenario, no matter the research agenda, is that government agencies will follow the computing center, and then private-sector firms doing business in (or trying to break into) the research areas that develop. There will also be support businesses to provide services to all those constituencies, as well as other businesses that want or need to locate near such a center. Our goal is to essentially create a campus, Anderson explained. Well see other businesses that are not even related to a high-performance computing center that would like to be around this. Hayden agreed, and used research and development of cloud computing as one example of what might emerge at Holyokes computing center, and how such work might attract businesses and jobs. One of the things theyve talked about with this center is studying cloud computing itself and how it can be made more efficient, and green, and how it can best be utilized, he explained. That also incorporates things like security; if everythings out there on the cloud, how do you keep it secure and how do you keep it proprietary? There are all kinds of complex computations that will be done in terms of how to do cloud computing in a way thats effective for business, he continued, adding that many private businesses could potentially be involved in this research, with the goal of bringing new products to the marketplace  products that could be produced in Holyoke. Such scenarios echo Holyokes proud past, said Anderson, noting that, in many respects, history will indeed be repeating itself. It was abundant, inexpensive hydropower and an infrastructure to support large manufacturing operations that put Holyoke on the map 150 years ago, she noted, and it is these assets that are collectively bringing the computing center to the city  and fueling speculation about what will follow it. 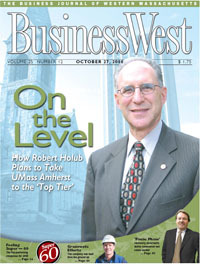 Indeed, while there are many unknowns when it comes to the computing center and the economic development it may generate, those who spoke with BusinessWest were in general agreement that Holyoke will certainly be well-positioned to capitalize on such opportunities. There are a lot of things happening in this city right now that are going to make it an attractive place for businesses to want to be, said Anderson, adding that the computing center could be the catalyst that compels business owners, federal agencies, and college presidents to look in Holyokes direction. Listing attributes and signs of progress, Anderson noted everything from the start of work on Holyokes Canal Walk to a large supply of former mill space that can be retrofitted to a number of uses; from an attractive location on or near several major highways to one of the lowest electric rates in the Northeast; from fast-track permitting to a strong fiber-optic backbone. All of this and more is captured in a recently released video designed to promote the city as an attractive home for businesses, especially those of the green variety. It features several players in business, industry, and economic development, including Anderson, Holyoke G&E General Manager James Lavelle, Universal Plastics President Joe Peters, and Brendan Ciecko, the 22-year-old entrepreneur who has made downtown Holyoke the home for his Web site design business Ten Minute Media. Summing up the content in the video and the many initiatives involving her office, Anderson said Holyoke has the wherewithal, and the creativity, needed to effectively leverage an asset like the computing center, making this city the proverbial right place at the right time for businesses in many sectors. But perhaps the biggest asset is abundant, green energy, said Lavelle, noting that Holyokes hydropower is part of an attractive package, which also includes high-speed fiber-optic services, that is turning heads in the business community and elsewhere. It obviously caught the attention of those at UMass, MIT, Boston University, and other colleges, who recognized the need for a high-performance computing center, but also the need to place it a community where the huge amounts of electricity needed for such a facility would be comparatively inexpensive  and green. Lavelle noted that the electricity his utility would provide to a large commercial customer like the computing center (which is protected to need anywhere from six to 12 megawatts for its first phase) would currently cost about 8.4 cents per kilowatt. Thats roughly one-third lower than the rates currently charged by Western Mass Electric Co., he said, and about half what large businesses in Cambridge, home to MIT, are paying at present. But its not just the rates that are attractive, he noted, adding that roughly two-thirds of the power supplied by HG&E is from renewable sources, mostly hydropower, and the utility is currently exploring ways to increase that percentage and also provide ample green power for all those who might want to come to Holyoke. More than 80% of our power produces no carbon footprint, and thats really attractive to entities looking to manage their growth and their carbon footprint at the same time, said Lavelle. And thats not unique to high-tech and education; were seeing it across the board. Our challenge is going to be to scale and increase our renewable content with this growth so that we dont dilute it. But the words green and renewable refer to more than just energy, said Anderson, referring to Holyokes vast inventory of old mill space and, in the larger scheme of things, its downtown as a whole. Just as companies and institutions may want to reduce their carbon footprint, she explained, they may also desire to be part of an effort to revitalize and reuse some of the old mills, putting them back to work for economic development. Hayden, a Holyoke native, said the high-performance computing center is the hot topic of conversation seemingly everywhere in Holyoke, from HCC, which is already exploring creation of programs to train people who would work at the center, to the Stop & Shop, to the Dam Café on Northampton Street. And it has drawn a number of references to Holyokes past and its meteoric rise as a manufacturing center, said Hayden, who, like Brennan and others, offered a cautionary note about the progress that could follow the computing center.